"Pola" was a Zara-class heavy cruiser of the Italian Regia Marina operating during the Second World War. She was the fourth of four ships in this class (Zara, Fiume and Gorizia were the other three), and she was built in the Odero Terni Orlando shipyard in Livorno in 1930, entering service in 1932. 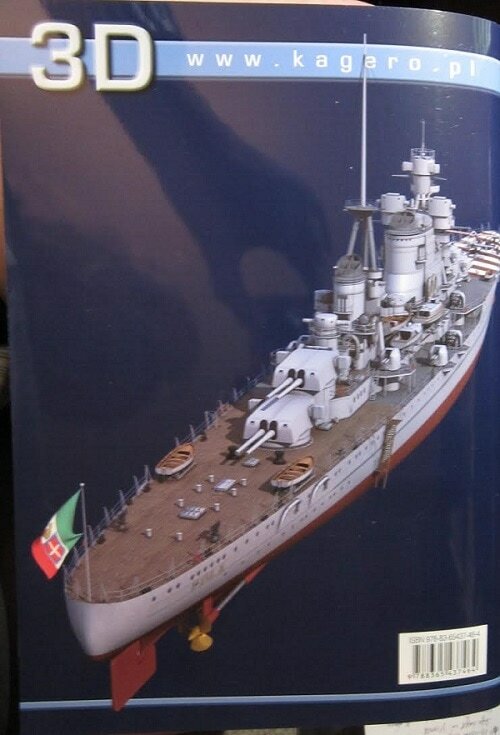 At the beginning of 1928, the Italian Regia Marina, not to be disadvantaged compared to other navies, needed to build new cuisers that could be used with Trento-class ships, until the economic resources of the Italian Government allowed them to build new battleships of to renovate the old ones like Cavour or Giulio Cesare. Since there was a standstill in the building and in the study of projects, the only existing one was what the Navy Ministry had prepared for a Trento-class cruiser in which the thickness of the armor was increased to 150 mm. Kagero Publications is based in Lublin, Poland. This book is soft-cover of 82 pages in 8 1/4" x 11 3/4" page format. It came in a self-sealing clear envelope. The cover art shows the Pola looking on from the bow and slightly above. It is overall grey with tan decks. The bow of it has red and white stripes painting on it for air recognition purpose. The back cover has the Pola shown from the stern and slightly above again. ​It contains 136 color illustrations in 3D, for which there is a pair of cardboard glasses inserted in the book that have one red lens and one blue one. There is a sheet that is 23" x 15 1/2" printed on both sides with line drawings in 1/350th scale. On the face side is profiles of the Pola showing its port and starboard sides and its top. The reverse side has a illustration of its front and rear, also in 1/350th scale. Inluded are illustations of a 5-view of a 150 cm searchlight in 1/50th scale, a 3-view of a life raft in 1/100th scale, a 5-view of a IMAM RO 43 float-plane bi-plane in 1/100th scale, a 5-view of a 40/39 mm Vickers-Terni gun in 1/50th scale, a 5-view of a 13.2 mm Breda Mod 31 gun in 1/50th scale and a 100/47 mm O.T.O. Mod 1927 turret in 1/50th scale. The sheet is folded 4 times to fit the book. The last page of the book has no less than 51 color covers of books about ships that Kagero publishes. Wow...that's a lot and you are bound to find the book about a ship that you need. This is a neat book and has 3D color illustrations of every inch of the Pola's anatomy, literally. There is a kit by Trumpeter brand in 1/350th scale of the Pola. 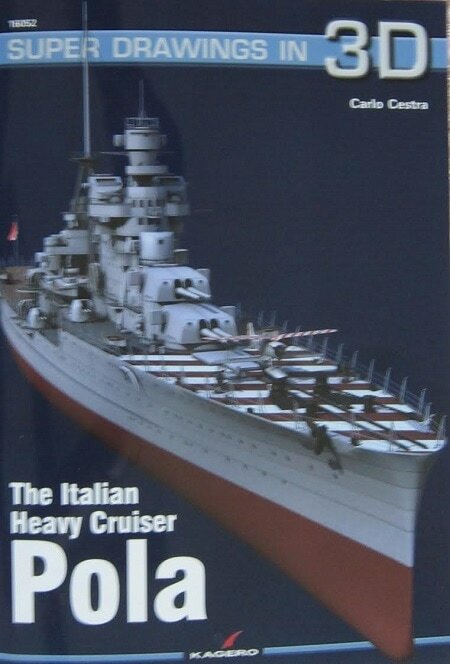 I have this kit and I did a review of it a while back that is in the ship model archives on this site. The book came in a heavily padded envelope from Casemate.